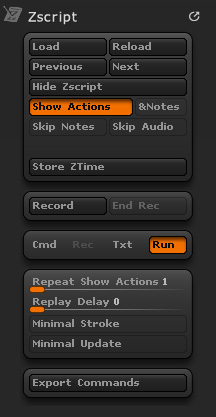 The Zscript palette has controls for recording and playing back Zscript recordings. Press the Load ZScript button to load a new ZScript into the ZScript window. The Reload ZScript button reloads the current ZScript in the ZScript window. This button is helpful if you’re authoring a ZScript using a separate text editor, and you wish to view the changes within ZBrush. The Previous ZScript and Next ZScript buttons enable you to navigate among, and reload, recently-loaded ZScripts. The Hide/Show ZScript Window button collapses or expands the ZScript window, located underneath the canvas. If you’re recording a ZScript, the Show Recorded ZScript button displays each action recorded, while it’s taking place, in the ZScript window. The Begin Recording Session button enables you to capture all your actions within ZBrush into a replayable ZScript. When you first press this button, you’ll be asked if you’d like to reset the entire ZBrush interface. This is recommended, since all painting and sculpting actions depend heavily upon conditions already defined. Resetting the ZBrush interface also clears all document data, as well as all customized tools and features. You should save all your work beforehand. The End Recording Session button concludes your recorded ZScript, and loads your recorded session into the ZScript window. After concluding the recording, you can press the Play button in the new ZScript to replay all your painting and sculpting actions. ZScript technology features a comprehensive command set that enables you to program complex ZBrush actions. If you’re interested in authoring an original ZScript (instead of simply recording your actions), press the Show ZScript Commands button to view all available ZScript commands, plus descriptions, displayed in the ZScript window. Save this list to a text file by pressing the Export Commands button. The Show ZScript Text button displays the internal codes of the current ZScript in the ZScript window. The Run ZScript button displays the currently-loaded ZScript normally, with all formatting, in the ZScript window. When replaying a recorded ZScript, it’s often helpful to view all buttons and sliders as they’re being manipulated. Show Interface Actions highlights each item when it’s manipulated, displaying a stylized ‘zoom’ animation. The ZScript Autonotes button, enabled only when ‘Show Actions’ is pressed, displays this help information about each item when it’s manipulated in a ZScript. If the Show Actions button is pressed, the Repeat Show Actions slider provides a way to increase the amount of time spent highlighting each item. This slider determines the number of times each the stylized ‘zoom’ animation is repeated when highlighting an item. The Replay Delay slider slows down the replay of a recorded ZScript, making it easier for you to follow along. Set this slider to 0 to replay the ZScript at its fastest possible speed. The Minimal Stroke button speeds up the replay of a recorded ZScript by minimizing the time spent while drawing brush strokes. The Minimal Update button speeds up the replay of a recorded ZScript by drawing all strokes invisibly, and updating the screen display only at the end of each brushstroke. The Skip Notes button provides a means of speeding up the replay of ZScripts which contain explanatory notes. Press this button to suppress all notes so the ZScript’s execution isn’t interrupted. The Skip Audio button turns off audio playback within ZScripts. Press this button to store the current ZScript/plugin runtime to a text file. The file will be named ZTime.txt and will be in the root ZBrush folder. If you’re interested in authoring an original ZScript (instead of simply recording your actions), you can press Export ZScript Commands List to save the entire list of ZScript commands, plus helpful descriptions, to a text file.